The Truck Industry Council has recently updated its National Truck Plan to support the modernisation of the Australian trucking fleet through a proposed government incentive scheme. SAFC strongly supports the Truck Industry Council’s proposition to provide the road transport industry an added government incentive to promote the greater rollout of more efficient and environmentally friendly trucks. Under the National Road Safety Strategy 2011-2020 the Federal Government is obliged to actively investigate incentives to modernise the nation’s trucking fleet and TIC’s “The Ageing of the Australian Truck Fleet: Implications and Opportunities” document more than adequately details benefits that merit government investigation. It is of great importance that Australia continues to reduce the noxious emissions resulting from road transport such as NOx and Particulate Matter emissions through investing in more modern, efficient and ‘greener’ equipment. The commercial decision whether to buy new equipment is driven by a company’s bottom line and as the average age of Australia’s trucking fleet in fact is growing it suggests that the industry does not have the resources to invest in more ‘greener’, efficient vehicles to the detriment of the economy and the health of local communities particularly those in urban areas. 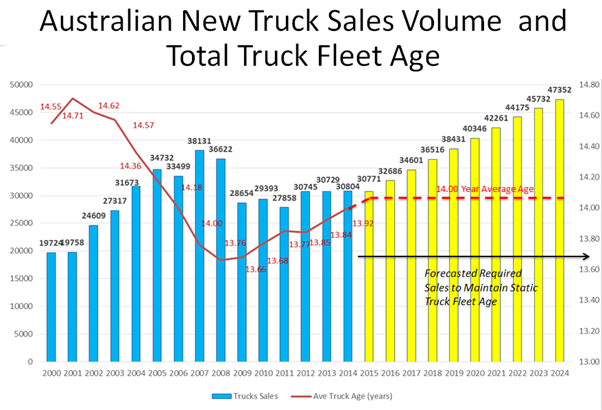 The latest ABS Motor Vehicle Census finds that 43% of heavy rigid trucks and 28% of articulated trucks were first purchased in 1998 or earlier. This would imply that a significant percentage of Australia’s trucking fleet do not meet any stringent emission standards that have been introduced progressively since 1996 via Australian Design Rules. According to the Truck Industry Council this is having a significant negative impact on the community. In 2013 the Trucking Industry Council looked to calculate the savings associated with a more modern trucking fleet (one with an average age of 8 years, with only 5% or less trucks purchased pre-1996). They found that Australian governments could save $1.97 billion through avoided health costs associated with noxious emissions. Furthermore avoided fatalities due to newer, safer trucks operating on our roads would result in an estimated saving of $164 million, and reduced carbon dioxide emissions could save $564 million (all savings in 2014 dollars). The big winner perhaps though would be the transport and logistics industry itself with a potential saving from reduced operating costs of $2.96 billion. Calculations undertaken by SAFC have illustrated that if the industry was successful in eliminating all pre-1996 registered heavy rigid and articulated trucks and replacing them with ADR 80/03 compliant ones then Australia could reduce the amount of NOx produced by heavy rigid and articulated trucks by 53% and from Particulate Matter by 79% (assuming all trucks travel an equal distance regardless of age). SAFC too has been active in calling for a similar incentive system. SAFC in the past has called for the Federal Government to consider introducing an Accelerated Depreciation for Freight Vehicle Scheme. Similarly SAFC believe such a system will bring forward the replacement of obsolete equipment (which will deliver operational, safety and environmental benefits). Undoubtedly such an incentive scheme would result in reduced government revenue, as accelerated depreciation is a kin to an interest free loan which allows a deferral of tax payments with no increase in the interest due. However SAFC believe such a system would replace outdated trucks with more modern trucks and in the end would result in a significant saving to government through the areas highlighted by the Truck Industry Council. Other countries have shown they are able to achieve this. In comparison to Australia about 40% of German trucks meet Euro V or ADR 80/03 standards (only 12.5% of Australian trucks meet these standards). The German trucking industry has been able to achieve one of the most efficient and ‘green’ trucking fleets in the world because the Federal German government has been proactive in providing incentives to the industry. The German government has subsidised the purchase of new trucks over 12 tonnes since 2007. Previously the subsidy covered around 50% of the difference between Euro IV and Euro V trucks to encourage operators to purchase a more environmentally sound truck. The German transport and logistics industry is further incentivised to purchase more modern trucks as they are charged a toll according to their engine emission standards on the nation’s Autobahn and a sizeable percentage of their highway network. Similarly TIC’s proposal includes a change to the charging of the industry’s Road User Charge, which they believe should be varied by the emission standards of that truck (in which the fuel tax credit is lowered for older trucks). This could provide a similar incentive that has produced success in Germany. TIC's document can be downloaded here.